St. Jean Elementary Home and School and The Charlottetown Royalty Rotary have partnered and have been chosen as a national award winner. 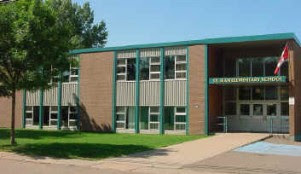 This group of volunteers from Charlottetown will re-develop the St. Jean Elementary School playground on May 26, 2012. This initiative will receive strong support and leadership provided by Let Them Be Kids organization. These “Playground Champions” will spend the next five months engaging their neighbourhood and all of Charlottetown in re-designing and improving the school playground located on Queen Street. “We are very excited with this project. The build went from years and years to just a few months. It is exciting to know our children will have a new place to play this summer." says Erin Hennessey, Co-Chair of the St. Jean Elementary Home and School. The improvement plans include the creation of a new playground structure with the addition of another swing set for the older children. Although the planning will occur over the next few months, on May 26th, it is hoped that hundreds of Charlottetown residents will volunteer to be a part of a one-day event that will see the community's dream come together and the playground built! Let Them Be Kids has partnered to help build stronger communities across Canada and help bring affordable fun and play to all children and families. St. Jean Elementary School was selected as one of the communities to receive the Let Them Be Kids-Helping Hands Award, providing support and resources to help make this community project a success. “This is going to be an exciting and wonderful day for our school,” says Erin Hennessey. "We are grateful to Let Them Be Kids for their support and guidance throughout the next few months as our playground dreams come true."